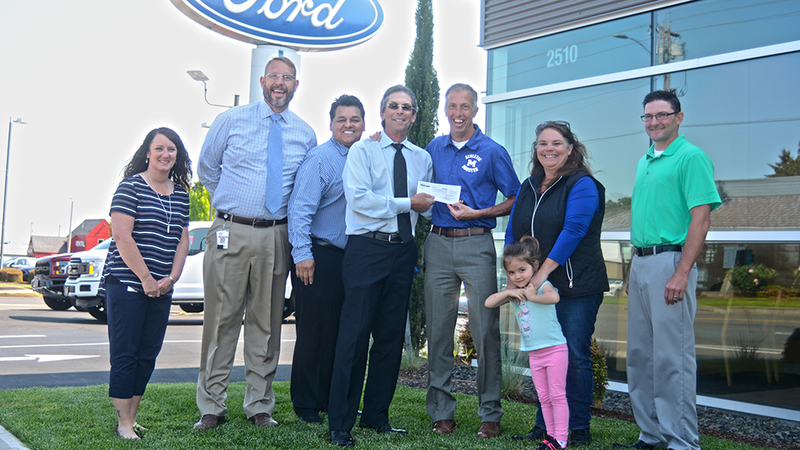 McNary’s Athletic Booster Club received a $50,000 check from Skyline Ford on Tuesday, June 5 to purchase a new scoreboard at its turf field. The new 18-foot, 9-inch tall and 25-foot wide scoreboard features a 5-foot, 9-inch tall and 15-foot, 11 inch wide LED screen for live track results and sponsors. The scoreboard can also post shots on goal during soccer games. Joe Egli, president of the booster club, said the scoreboard is scheduled to arrive in six weeks and will be unveiled at McNary’s Blue Day on Saturday, Aug. 18. By graduation day most of McNary’s class of 2018 will have decided what they will do next—work, travel, enter the military or prepare for college. Some of you will toss your mortar boards into the air at the ceremony vowing to be rid of school forever. That’s viable, that’s a choice. There are no wrong choices when designing your life. And that’s what you will do, whether your school days are over forever or whether this summer is just a respite from your next educational step. Do no harm. Don’t be intolerant or mean to others. Everyone is on their own journey on their own timeline, be patient. Don’t get angry unnecessarily—the country already has too much faux rage about little things. Don’t add to it. No one’s perfect. People don’t always succeed the first time. Winners keep trying to attain their goals, learning from their mistakes and setbacks. Don’t fear failure. It took a lot of failures to finally put man on the moon or to develop smartphones. Keep at it, people admire those who have perseverance, not quitters. Keep an open mind. About everything—people, places, things; a rigid mind makes for a small person. Live well and let others live well. Be part of a solution, not part of a problem. Respect others in mind and body, respect your own body. When it comes to your peers, be a mentor. As a classic book of 60 years said, life is a banquet. So it is, grab yourself a heaping plate of life and dig in. Keizer businesses and citizens are due a standing ovation for the way they helped our neighbors to the south amid their contaminated water crisis last week. A health advisory for Detroit Lake was issued due to toxics from blue-green algae in the water made direct contact unsafe for humans and animals. Salem gets its drinking water from Detroit Lake. Children under the age of 6, the elderly and those with compromised immune systems were advised not to drink the water from their taps. That sent Salem citizens on a furious search for bottled water which, unfortuately bred price gouging by some retail outlets. Keizer gets all its water from aquifers under the ground and it is accessed with wells throughout the city. It didn’t take long for Keizer businesses to start posting on social media that the water was fine in our city and Salem residents were invited to come and get what they needed. Keizer businessman Nigel Guisinger was instrumental in getting a campaign started through the Keizer Chamber of Commerce to offer water to Salemites. Soon, Facebook was filled with posts from generous Keizer residents and businesses inviting Salem to come and fill up their containers. The initial advisory was lifted early this week, but on Wednesday an advisory was renewed. It is in America’s DNA to help others. We do unto others as we wish they would do unto us. It’s no different in Keizer, we jump into action when our neighbors need help. Kudos to all the residents and businesses who opened their taps. Homeowners along the Willamette River have been concerned about stray bullets being fired onto the Keizer side of the river. They are fearful that someone could get hurt, even testifying before the Keizer City Council imploring the city to make it stop. Those concerns were well-founded. A riverfront home was pierced by a bullet, coming within several feet of an occupant before shattering a backsplash in the home’s kitchen. Polk County Sheriff’s officers were dispatched and cited four men for reckless endangering and released in lieu of arrest. That is of little solace to those who live on the river. No one should live in constant fear or flinch when they hear a loud noise—that’s no way to live. The quarry in Polk County has been a favored site for gun enthusiasts for years. After a stray bullet incident in 2017 the owner of the property was alerted and signs were put up on the property to alert shooters about the homes on the other side of the river. That, obviously, is not enough. No one’s property or gun rights trump the rights of others to live peacefully and without fear of bullets smashing into their homes or their bodies. Mayor Cathy Clark and Police Chief John Teague need to form a united front and communicate with the Polk County Sheriff and all the Polk County Commissioners that a solution must be found. It would be better to solve this government official to government official. We would rather see that happen than this incident open a protracted civil action in the courts. When my cat went missing on May 23, I learned a resident here at Briarwood Estates traps cats. I started investigating. I put up missing cat flyers. I talked with a lot of neighbors that did not know, like me, till my cat just disappeared. The onsite manager confirmed he knew of a resident that trapped cats and that he’d given permission to do so. That is disturbing news. The onsite manager said there was a feral/stray cat issue in this park. I disagree; these are people’s pets. If you trap any cat, you take it to the Humane Society and get the cat scanned for a microchip. My cat is chipped, spayed and a member of our family. I spent every day he was missing looking for him. I was desperate for answers. I asked the resident if he traps cats. He said yes he did, along with other animals. He said they are a nuisance and use his good soil as a litter box. I then asked him if he trapped my cat. I told him I want to know where my cat is and what happened to him. He pointed north and said he released my cat on property north on River Road, near Brooklake Road. My heart sank. I went there and couldn’t find him. The owner of the property and I exchanged numbers promising to call if he sees my cat. What the onsite manager and the resident did is wrong, wrong, wrong. All this information was agonizing to comprehend. My cat walked into his baited trap, which he told me he baited, and he took my pet and just released him in a field some where. This resident lives a block from my house. My cat was missing for 11 days. The owner of the River Road property called to say he saw my cat. I rushed over there and brought him home. I want to thank my neighbors for letting me know they were looking for my cat, Shadow, and praying for his safe return. I will never forget what this man did to my cat. It’s animal abuse. America suffers from a persistent misunderstanding of the role of character in public life. For some— a diminishing few—political leaders should be moral exemplars. They should be men and women whom children can look up to and emulate. Democrats surrendered this standard in their defense of Bill Clinton. Republicans are abandoning this standard in their defense of Donald Trump. There is apparently no remaining constituency for the belief that high office should involve moral leadership. Given human nature, this expectation was always a recipe for disillusionment. But while it is true that politicians are not called to be pastors, something has been lost in abandoning the ideal of rectitude. Clinton did not just conduct a quiet affair. He exploited an unequal power relationship for sexual favors. He expanded the boundaries of acceptable exploitation. Trump did not just [allegedly] have a fling. He bragged about sexual assault and dismissed it as locker-room talk. He expanded the boundaries of acceptable misogyny. And political leaders —displaying good public character—have helped determine those expectations. It mattered when Theodore Roosevelt invited Booker T. Washington to dinner at the White House. It helped break an oppressive social convention against the social mixing of blacks and whites. It mattered when President Clinton began the tradition of celebrating Eid al-Fitr at the White House. It sent the signal that American public traditions reach beyond Protestantism, Catholicism and Judaism. It also mattered when Trump in 2017 discontinued the White House Eid celebration. A significant factor in Trump’s appeal has been the argument that “political correctness” has gone too far. There are college campuses—yes, you, Evergreen State College—where consciousness has been raised into the stratosphere of silliness and boorishness. But Trump’s political use of this idea has had little to do with academic freedom and disruptive student protests. It has had everything to do with testing the limits of prejudiced public language against migrants (particularly Mexicans) as potential rapists and Muslims (particularly refugees) as potential terrorists. This is a failure of public character with serious consequences. Trump is urging Americans to drink at a poisoned well of intolerance. This desensitizes some people to the moral seriousness of prejudice. It creates an atmosphere in which bigots gain confidence and traction. And one sad social consequence is the emboldened racism of Roseanne Barr and many like her, many of whom surely believe —on good evidence—that the president of the United States is on their side. The combination of Trumpism, social media and (at least according to Barr) sleeping pills create a powerful disinhibition to hatred. Our nation thankfully recognizes a number of Americans who have contributed greatly to the country’s growth and development as bright and shining stars for all others to emulate. Former President John Kennedy’s Profiles in Courage pays homage to a number of these citizens while American literature and media have added a rather lengthy list of Americans deserving special recognition in addition to JFK’s collection. Meanwhile, we’ve also had a dark side. Although the Ku Klux Klan was first organized immediately after the Civil War and helped to end Reconstruction in the former Confederacy, it had a re-birth during the 1920s and ‘30s when it invoked racial hatred toward African-Americans throughout the country and directed its wrath toward Catholic Church members and new immigrants, mainly from China. The KKK has endured but it has been too offensively despicable for mainstream Americans, subsuming it to unacceptable status in modern times. The so-called Red Scare was another dark episode that commands attention, this time in the 1950s. Then-U.S. Senator Joseph McCarthy, a Republican from Wisconsin, rose to fame and power when, in February, 1950, he charged that “hundreds” of “known communists” were in the U.S. State Department. His Red Scare charges convinced millions of Americans that communists had infiltrated all of American life. After McCarthy attacked the U.S. Army as communist infiltrated he was viewed as a person “without a sense of decency” and sent to history’s dust bin. It is high time once more to take issue with a D.C. resident, President Donald Trump, who, daily, tells lies, presents falsehoods, perpetrates tall-tale whoopers, speaks half-truths along with scary inconsistencies, commits snake-oil salesman exaggerations, espouses conspiracy theories and delusional, self-serving analyses, and, of late, trumpets misbegotten pardons, destructive tariffs and more unfounded mendacities that have been proven untrue and unfounded. By the way, unless our U.S. Constitution with its separation of powers no longer governs this land, Trump cannot pardon himself. It all adds up to a moment in America where a majority of us who are dedicated to preserve and sustain what we most appreciate and value must protest the mindlessness and apparent self-protections by a president who blatantly embitters and poisons our public culture. Further, Donald Trump’s collusion with Russia was concretely established by way of the meeting by his son, Don, Jr, his son-in-law, Jared Kushner, and his former campaign manager, Paul Manafort, when they met with Russian foreign agents to discuss “dirt” against Hillary Clinton and her presidential campaign. At the same time, it has been wholly disheartening and shockingly disappointing that, among the 535 voting members in the U.S. Congress, so few have come forward to denounce the divisive, antagonistic and reckless language from Trump that the American people find more often offensive and un-American than not. Examples of the few brave souls who’ve stepped up to defend truths include a Republican senator from Arizona, Jeff Flake, a representative from South Carolina, Trey Gowdy, and even an anchor on Fox News, Shepard Smith, has been courageous enough to stand up. Our Oregon representatives in the House have been silent save for the one Republican in the state’s second district. Otherwise, the others from the remaining districts have been in mute mode for reasons not disclosed. Our senators, Ron Wyden and Jeff Merkley, have been outspoken at times but, to this writer’s knowledge, have never confronted Trump to his face. The future of our nation as a democracy, with a Constitution and Bill of Rights, our institutions (especially the Department of Justice now), laws, traditions and norms, is at stake by what’s happening in our nation’s capital. Personally, this writer cannot fathom a future where what’s been held in the highest esteem could be lost to a leader with little to no respect for the rule by law. Faith is that the American people will rise in great numbers as they have in the past to oppose authoritarian overreach by what’s offensive and unacceptable for the U.S. present and the future. Crystal Llanos thought she might be hallucinating. 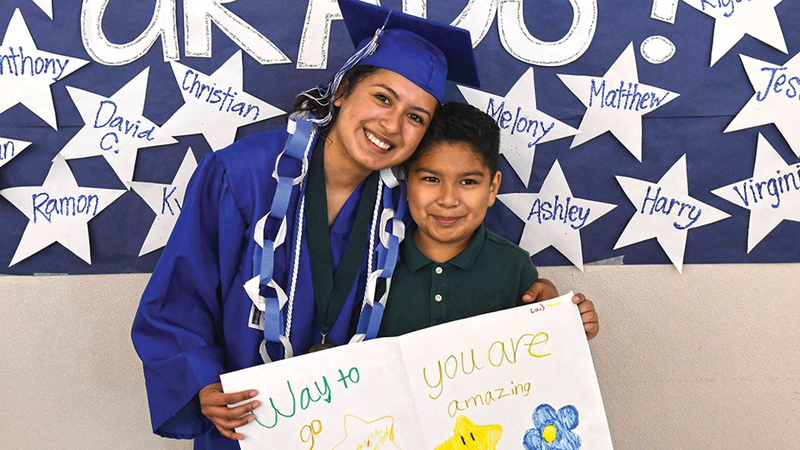 So the McNary senior brought her laptop and showed the letter to her sister, the one congratulating her for being admitted to Stanford University, which at 4.3 percent had its lowest admission rate in the school’s history. Lower than Harvard (4.59), Princeton (5.5) and Yale (6.9). Linda confirmed the letter. It was real. Llanos’ dream school was the University of Southern California. She only applied to Stanford because two of her close friends did. But Llanos still worked hard on the application, spending an hour to two every night for three weeks, writing and then re-writing her answers. In early December, Llanos met with her friends for dinner to celebrate how hard they had worked on their Stanford applications. When her friends read they had not been accepted, Llanos didn’t think she had a chance. She waited hours to open her email from Stanford. After building up the courage, Llanos discovered she was deferred and Stanford was still considering her application. Llanos had to wait until April 1 for Stanford’s final decision. Meanwhile, she was working on her application to USC, which wasn’t going as well as she had hoped. The end of March, during McNary’s spring break, Llanos got a big acceptance package in the mail from USC. A week later came the letter from Stanford. To make a decision, Llanos had to see the two schools for herself. In one weekend, April 26-28, she spent two days at Stanford and then one at USC. Stanford emailed a travel grant to pay for her flight to San Francisco. Willamette Academy, which Llanos has participated in for the last five years, helped pay for the flight to Los Angeles. The other students surprised her. But what won Llanos over was that Stanford, with its ethnic-themed community center and dorms, felt like home. “The scary thing about going to any college, especially one that’s very selective, is where am I going to find the people like me? Underrepresented minorities, people that are low-income, people that didn’t think they were going to have this chance, people that weren’t supported by their families or families who have no idea what college is like,” Llanos said. “Where am I going to have these people that I can relate to? Stanford understands that very, very well. While the campus was “gorgeous,” Llanos didn’t get the same feeling at USC. Llanos plans to major in biomedical engineering but is keeping her options open. After college, she wants to open a non-profit healthcare organization to provide medical technology to minorities and people of low income. “I want to go down to Mexico because that’s where my roots are,” Llanos said. Shots fired from an old quarry being used as a makeshift shooting range across the Willamette River made their most invasive presence known in Keizer Saturday, June 2. Four men were cited for reckless endangering and are expected to be in court later this month. At 10:06 a.m., Keizer police responded to a home in the 1300 block of Raphael Street North. 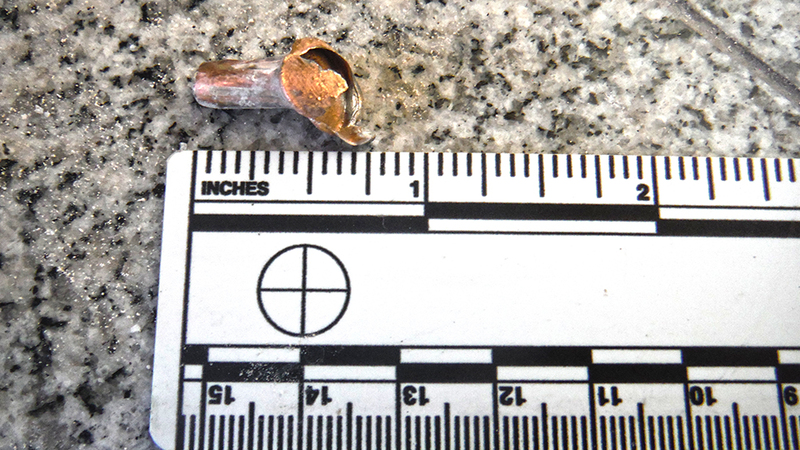 Officer Jeremie Fletcher recovered a bullet, believed to have been fired from the shooting range, after it penetrated the home exterior wall and collided with a granite backsplash. “The bullet came to rest on a kitchen counter inside,” said Deputy Chief Jeff Kuhns of the Keizer Police Department (KPD). One of the homeowners was in the kitchen when the bullet came through the wall. KPD coordinated with the Polk County Sheriff’s Office that dispatched officers to the quarry. “We went out there and found four people target practicing. All cooperative and remorseful,” said Polk County Sheriff Mark Garton. Emmett and Wyatt Davis, 18 and 20, respectively, of West Salem; Noah Murayama, 22, of Keizer; and Austin Williams, 27, of Salem were all cited for reckless endangering and released in lieu of arrest. Garton said even if the bullet had not traveled into a home, the four suspects were negligent. “The way they were shooting was not safe and we could still have charged them,” Garton said. The foursome is scheduled to appear in Polk County Circuit Court June 26 at 1:15 p.m.
Kuhns added that Keizer police are continuing to investigate the incident and additional charges may be forthcoming. The incident follows a similar one that occured in September 2017. On Sept. 10, a hail of bullets drove visitors out of Sunset Park and residents out of their homes. Police officers confronted a group using the shooting range and led officers to a car with an AR-15 inside it but no one confessed to using it. Officers could not prove the AR-15 had been fired or who had done so, but they suspect someone was using it to shoot at clay targets tossed into the air. Several residents then turned out at a Keizer City Council meeting to implore the city to take action. “What I’m most concerned about is the fact that someone is going to get killed if something doesn’t get done. When the powers-that-be tell us no one would admit to using the gun—if someone had been killed, would that be how this was handled?” asked Marge Smith, a resident of the area. Sgt. Andrew Copeland met with the owner of Northwest Rock, Lance Davis, and signs were put up to remind users that residences were located across the river. Mayor Cathy Clark addressed the issue again at the city council meeting Monday, June 4. Residents of West Keizer have complained about the noise from the shooting range for several years. On some weekends, shots are heard from morning until night.